It can be sweet, sour, and even downright smelly: fermented food. Despite its relatively stinky reputation, this super food is (re)hitting the ground with force; all kinds of chefs have begun incorporating it into their menus. 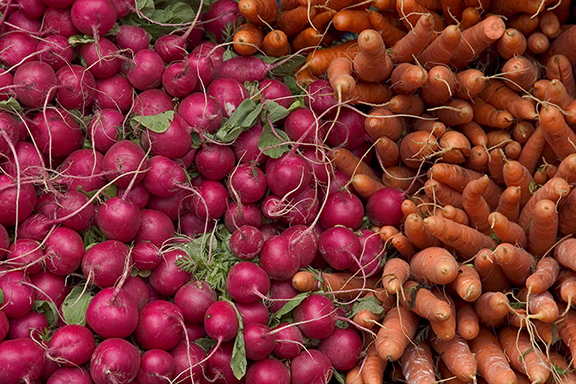 During fermentation, food is biologically transformed by the bacteria and other microorganisms that live in or on it. “In general, a pool of larger-molecular-weight, and usually less flavor-active molecules … are transformed into a more diverse group of tastier, smaller molecules, such as amino acids, organic acids, esters … and aromatic compounds,” explains this NPR.org article. Many chefs, such as David Chang, have started to cook more with fermented food; the fermentation process is rather simple and helps release a food’s inner flavors that cannot be tasted otherwise. 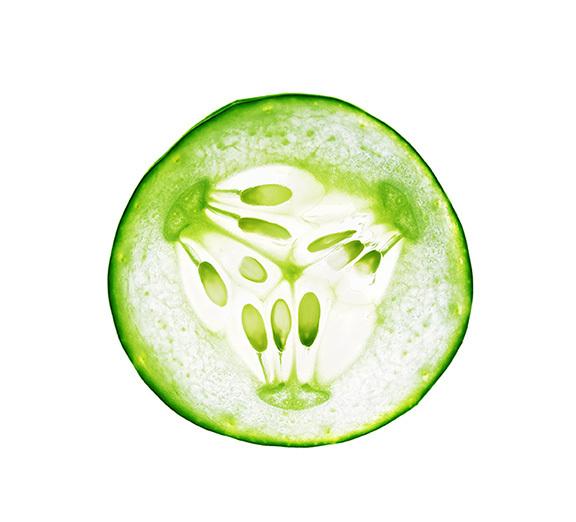 A good example is the simplest of all– the pickle! Think of the different between slapping some sauerkraut onto your hot dog versus throwing down some straight, raw cabbage. Big difference, eh? That’s because the fermentation process is a flavor-boosting phenomenon! Chang gave a lecture at Harvard about the fermentation process and how it can affect and enhance our cuisine in the future. He describes fermentation as “when rotten goes right” since the rotting process is what extracts all of the delicious flavor and nutrients! He and his team plan on trying their best to incorporate this “universal process,” as he calls it, into American cuisine to establish it as part of the culture. Doing so will help improve the flavors of our food as well as increase the overall nutrition of the food– a dire objective for American cuisine. Although our world is full of delicious, ethnically-diverse spices, their cost can be rather…. alarming. Fermenting ingredients, such a garlic cloves, releases a whole new type of flavor that can create a party on the palate. Whether you like spicy, sweet, or tangy, fermenting ingredients can help release a delicious flavor that can challenge that Machalepi (a rather expensive, ethnic spice). As we’ve talked about before in our blogs, fermented food is chock-full of probiotics. Good bacteria is what breaks down the food, causing it to ferment. Just like the flavors in the spices, the probiotic levels in food get heightened and can be used to help increase your daily intake of these powerful microbes. With society now leaning toward more healthy food, chefs are adopting this practice of fermentation to help their restaurants reach the health-focused foodies. 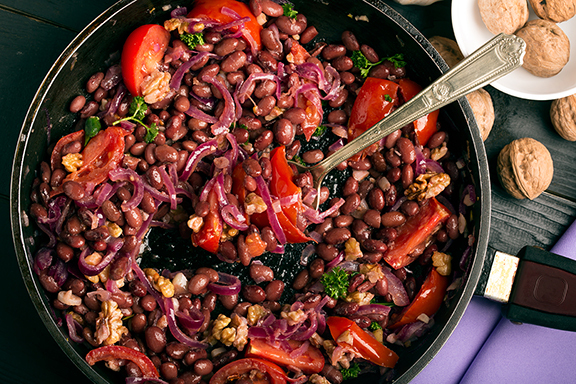 Professional chefs aren’t the only people that can use the power of fermentation! 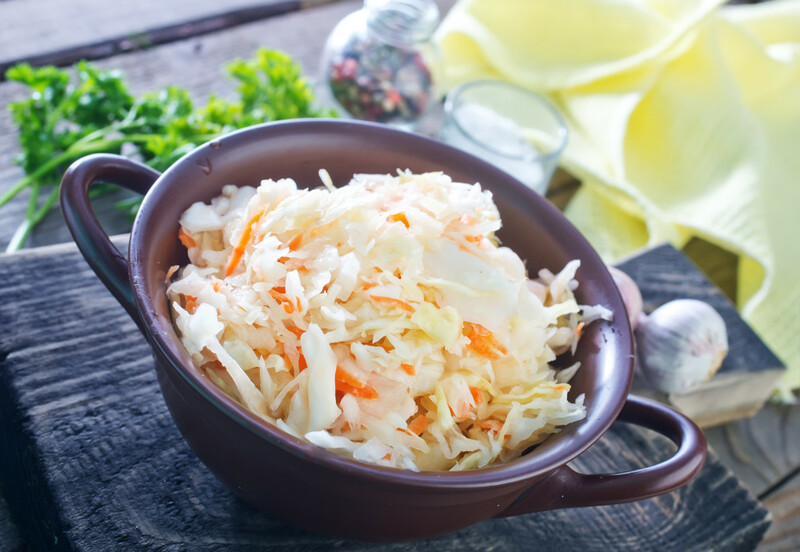 If you like to cook and are interested in giving your menu an extra boost of probiotics, check out different fermented food that could benefit you and your family! 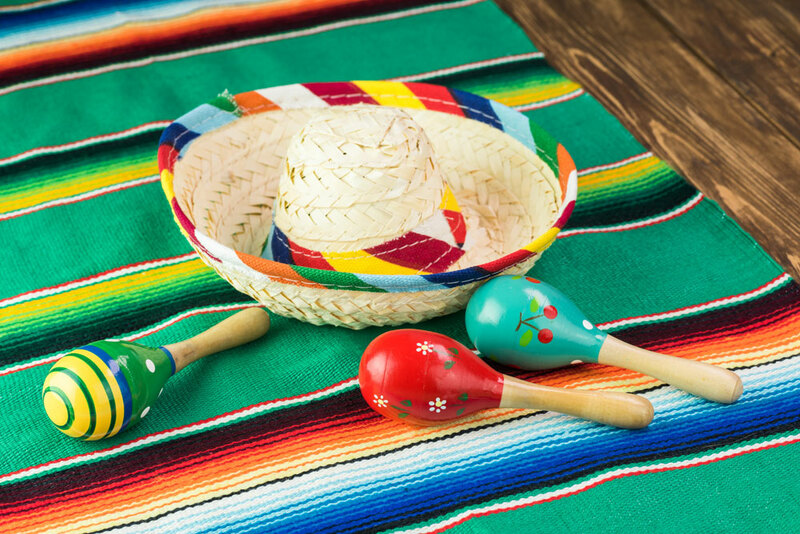 All of our fans of Mexican cuisine are gonna want to listen up this Cinco de Mayo! Although greasy meats, melted cheeses, and chips with salsa sound like a good idea when celebrating, the next day your whole digestive system and/or health could be jeopardized. Those fatty, sugary foods are NOT going to like you as much as you like them, as they can throw off your microbiome, the power-house of your body’s health. Probiotics are a great way to get your body back on track; but instead of doing damage control after the celebrations, you could eat fermented foods, a great source of natural probiotics! So maybe celebrate Cinco de Mayo at home this year with this list of fermented food recipes that are sure to keep your microbiome and your cravings happy. Mexican Carrots and Fermented Fiesta Dip! To substitute those chips and salsa for a healthier option, perhaps try spicy, fermented carrots with a delicious, probiotic-fueled dip! This recipe requires a little planning, so you may want to do a little preparation before your celebrations; however, the taste, spice, and added healthy qualities make this a snack you will not want to miss! We all love a jalapeno every now and again, but did you know that there are plenty of other fermented veggies that are used in Mexican cuisine? This particular blend of onions, peppers, garlic, and cabbage is sure to help bring an extra something to your burritos or fajitas! It is a little spicy, so beware! Although you may not recognize the name, this essentially translates to pickled jalapenos; this recipe, however, contains a much larger variety of tasty peppers and spices to give any taco an added kick! You can make this yourself or buy it from the store, so there’s really no excuse not to have something a little extra and a little spicy dolloped onto your favorite Mexican dish this Cinco de Mayo! Love Thanksgiving food but hate the discomfort that often accompanies it? 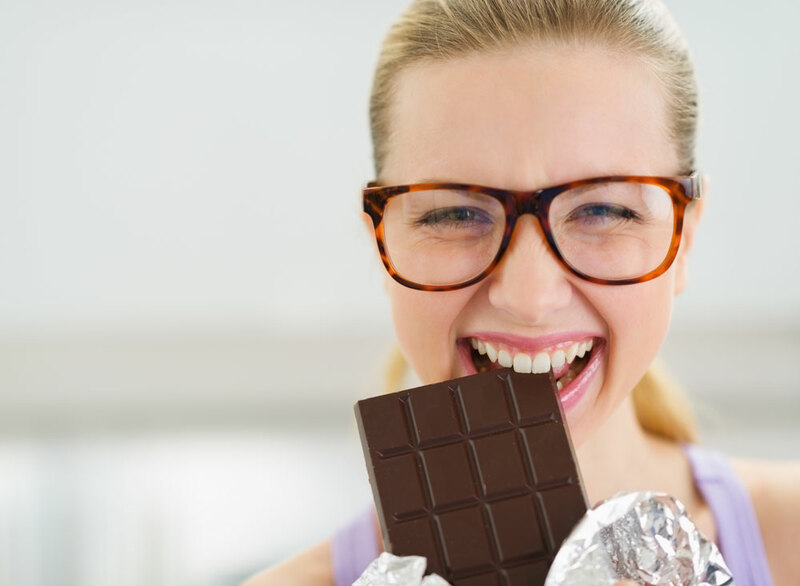 Beat the bloat and stay on track with these simple tips. We’ve got some pointers that will keep you spreading holiday cheer during Thanksgiving and through the days that follow. An active body is an active metabolism, which looks pretty good for your digestion. So if you are spending any prep time in the kitchen before the big dinner, use it as an opportunity to kick start your metabolism. If you’ve already done the work, see if you can help family and friends prepare their special meal. It’s a great way to say “thanks” to loved ones, while giving your digestive system some extra love. And if you’re looking for a surefire way to target different components of your digestive system, channel your inner yogi and bust these yoga moves. As a general rule of thumb, remember this: “Light exercise that increases breathing and heart rate can help to produce more efficient bowel movements,” reports Livestrong. We’re not here to tell you what you can’t have. After all, the holidays are about indulging. So, go ahead and have those mashers, that pumpkin pie, and –the main attraction– turkey. Our advice? Indulge in these Thanksgiving favorites moderately. A few bites here and a few there will keep your taste buds satisfied and your digestion on track. Thank your digestive system for all of its hard work and show it some love with friendly, gut-nourishing microbes. A daily probiotic may promote enhanced digestion and relieve symptoms attributed to digestive distress† . 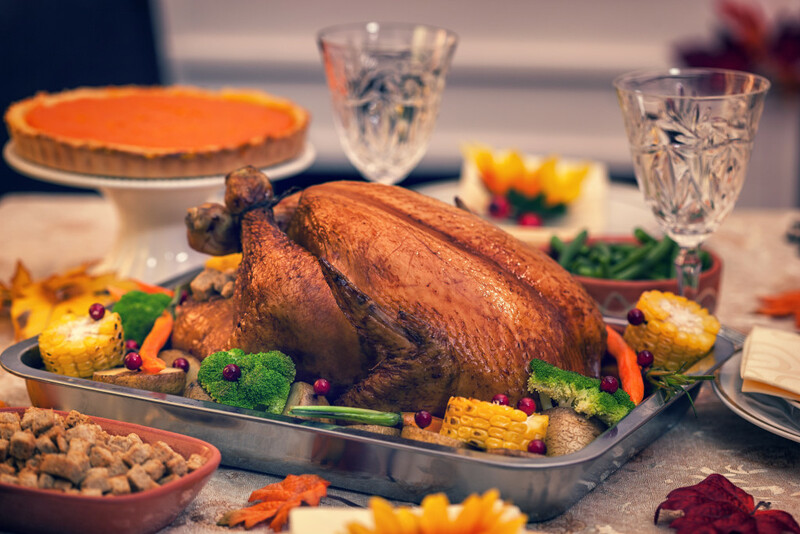 In a few simple steps, you’ll set yourself up for digestive success on Turkey Day and the holiday festivities that ensue. Get Pickled. And, No, We Don’t Mean Drunk. With unadulterated access to an overabundance of fresh fruit and vegetables during summer, it’s a shame to see the seasons change. But don’t think that just because the tomatoes have fallen from the vine and the leaves are changing, you cannot enjoy your summertime favorites year round. Pickling is your secret weapon against insipid and uninspired menus. The reason being that pickling enables you to add a tangy twist to preserved fruits and veggies, so you can add a splash of color to your plate on the coldest of days. If you’re a pickling newb, don’t let daunting mason jars and an empty knowledge bank deter you from getting started. We’ve highlighted some crucial details to get you familiarized with this DIY staple. Before you start anything, we need to set the record straight. Pickled food isn’t synonymous with fermented food. We’ll keep it simple. Pickled food can be –and often is — fermented. However, you can have pickled food that is not fermented and fermented food that is pickled. To make things clearer, we’ll help you learn what exactly pickling is and is not. Pickling something is simply processing food in an acidic substance, ergo preserving it. In effect, the original food source’s flavor becomes altered – often sour or tangy. 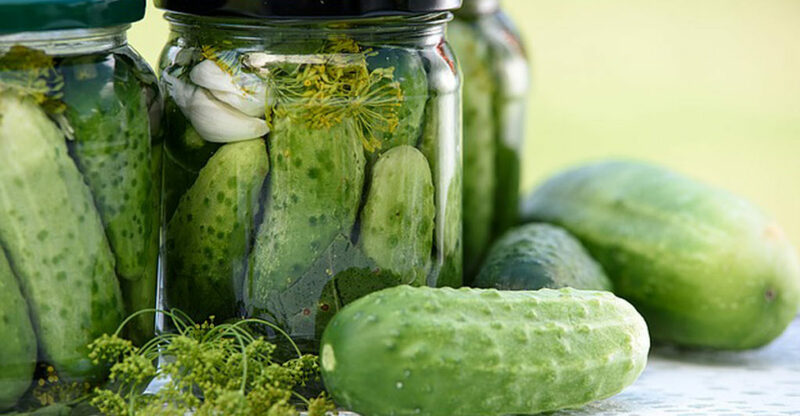 It is not unusual to see items pickled with vinegar, which is sometimes referred to as “quick pickling.” This is especially true of store-bought varieties. This vinegar taste is sometimes mistaken as fermentation, since many fermented items have a strong acidic taste, resulting from the by-product created during the natural fermentation process. While both fermentation and pickling create a natural preservative, you now understand that one is not necessarily the other. 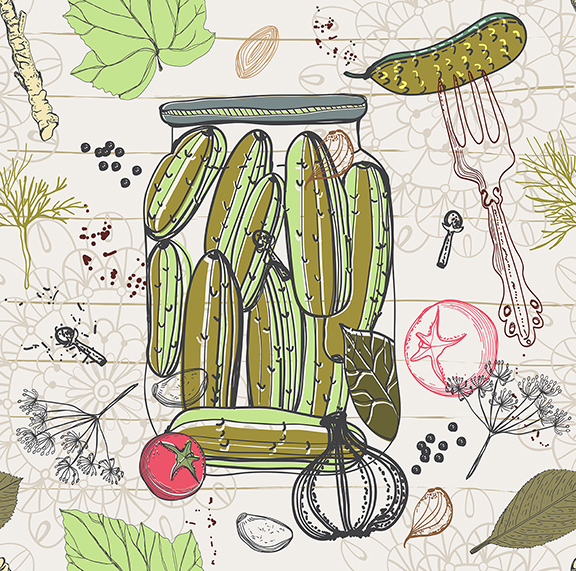 As proponents of beneficial microorganisms, we’re a fan of pickled foods that have been fermented. It’s the best of both worlds. You get the tangy taste you love, along with the natural lactic acid bacteria (read: probiotic) byproduct of the fermentation process (otherwise lost when opting for quick pickling). And don’t let the whole bacteria aspect of creating pickled, fermented food intimidate you. All you need is some filtered water, a starter, and some salt. Oh, and don’t forget a fruit or veggie of your choosing. For the best pickling results, there are some good checks and balances. We’ll get to that in our next blog, though. So come back and visit us next week, okay? We have talked about ways you can promote good digestion during Halloween and Thanksgiving, but let’s face it – we are officially amidst the longest holiday season of the year. With work functions, family gatherings, and holiday soirees, comes a lot of feasting. That said, ask this question: Is your digestive health in optimal condition for what lies ahead? By laying down the groundwork for heaping plates of food and the occasional indulgence in holiday treats, you will be able to better digest throughout the rest of the holiday season. You don’t have to overdo the spirits to get in the spirit of the holiday season. In fact, you should make sure to swap out the occasional alcoholic beverage with a tall, refreshing glass of water. By staying hydrated with the good stuff – h2o – you are doing one of the best things you can for your digestive system. The reason it is so important is simple: Water keeps food moving through your digestive tract in an effort to prevent digestive “traffic jams.” You know that encouraging friend who can sometimes push you to do something you otherwise wouldn’t do? Water is your digestive system’s bestie, and there is plenty to go around! Now, that’s something to raise your glass of water to and says cheers, isn’t it? If you have ever been really stressed, it should be no surprise to learn that stress can have some unexpected – and unwanted – effects on the human body. In fact, too much stress can send your digestive system “into overdrive,” resulting in an array of complications. Fiber, fiber, fiber. The reason you are always hearing about the value of fiber in a well-balanced diet is because it is key to good digestion. 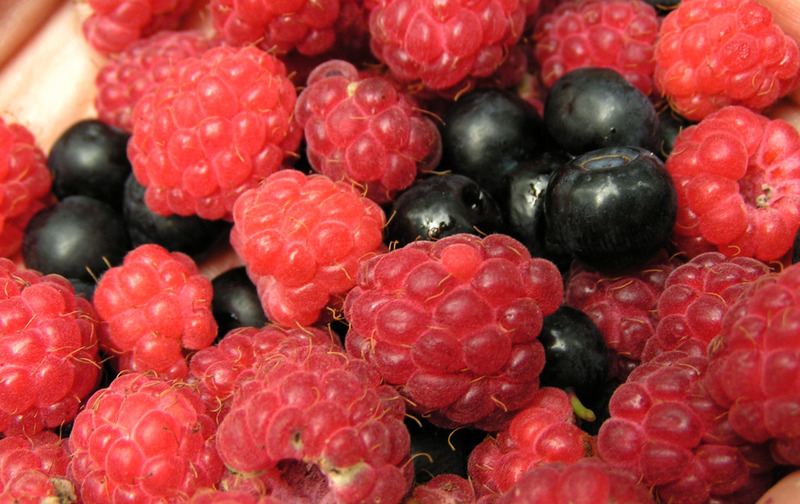 In addition to stabilizing your blood sugar, fiber works alongside water to keep you regular. To put things in perspective, consider that the absence of fiber can cause painful constipation and uncomfortable bloating. Not to worry, though. The good news is that you can enjoy fiber in a number of yummy foods this holiday season. For a good start, place some bowls of pistachios around the house for light snacking. Raspberries are also a rich source of fiber and immune-boosting antioxidants, so find fun ways to integrate them into your favorite holiday recipes. Lastly, don’t reserve popcorn for being strung on the tree. Popcorn sans butter and salt is a great source of fiber that will satisfy your more savory cravings. Probiotics are all the digestive-health rage. With these powerful microorganisms working to maintain your gut microbiota balance, you can reap an array of digestive benefits. From relief from gas and bloating to increased regularity, probiotics have the potential to act as your daily defense from undesirable digestive issues. Found in foods like kefir, pickles, certain yogurts, and miso, as well as supplements, there are plenty of ways for you to get your daily dose of probiotics. As a rule of thumb, look for live probiotic cultures, like those found in SCD Essential Probiotics. By integrating these digestive aids into your daily diet, you can enjoy the holidays all season long. For more tips about digestive health and news about probiotics, stay tuned into our blog. And don’t forget to order a FREE bottle of our all-natural, 11-strain probiotics formula – it’s our gift to you this holiday season. Navigating through your grocery store or prescription aisle when you’re trying to pick out the healthiest foods for you and your family can be a minefield. With growing concerns circulating about GMOs (genetically modified organisms) in our food, it’s more important than ever to be conscious of what we are putting into our bodies. Staying away from processed foods is a given – but with so many things still claiming to be ‘organic’ or ‘all-natural,’ how can you tell what the good stuff still is? In its simplest form, all-natural food is food or product that comes directly from natural plants. However, while some foods and products begin as all-natural, manufacturers can add various ingredients or additives that corrupt the natural quality of the product. The FDA says that, from a scientific perspective, it is hard to define a food as ‘all-natural’ since, undoubtedly, it has gone through some sort of processing, making it “no longer the product straight from the earth.” However, the FDA will approve a natural label if the product does not contain added color, flavors, or substances. That helps narrow things down, but not by much. Because of this, we have another helpful tip. If you question the validity of an all-natural claim, it’s time to check the ingredients label. This could be your most valuable weapon in helping defraud products claiming to be all-natural. Read the list of ingredients, and if there are any that a fourth grader cannot pronounce, look it up. This allows you to verify if it was made in a factory instead of being harvested from the ground. Although these may seem like obvious tricks, they can help you navigate through endless labels, deciphering which ones are truthful when selling themselves as all-natural. In this day and age, it is especially important to be able to understand what you are putting into your body. As technology becomes more efficient and companies are able to manufacture food, you need to be prepared with a method for nourishing your body with the natural substances it needs to run at its peak level. That said, you’ll be amazed what a little extra reading and conscientious shopping can accomplish. By implementing these tips into your consumer life, you will be able to make those healthier choices. If you are looking for an all-natural liquid probiotic that comes equipped with 11 LIVE strains, look no further than SCD Essential Probiotics. We offer a comprehensive formula, designed to help you lead a healthier life.